This function allows to automate measurement by creating programs for entry of measurement conditions and other tasks. You can program a sequence of measurement procedures from entry of measurement conditions (wavelength sweep width, setting resolution, etc.) to analyses, data saving, output, and others (eliminating redundant procedures on the production line). The instrument acts as the controller of other connected devices, controlling them through the LAN or RS232C port (letting you build an automatic measuring system without using an external PC). 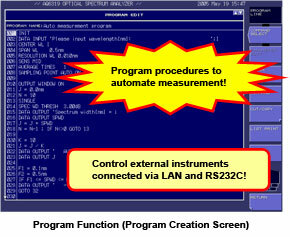 Input measurement conditions or output measured results while programs are running.